A little while ago, I was sent a copy of Odin's Ravens by the team at Osprey games. It's one of the perks of writing games for them that I sometimes get a freebie sent my way. As you may know, I play more boardgames (and by association, card games such as this) than any other games, so I'm always happy to see an old classic such as Odin's Ravens being republished. 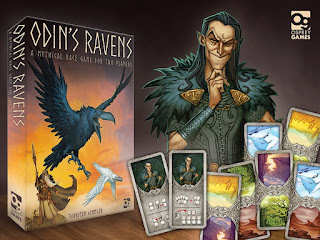 Truth be told, I've not been especially thrilled with the other boardgames released under the Osprey Games umbrella, but Odin's Ravens was a good choice for them to pick up the rights to. I was going to write a nicely positive review - I generally don't review games that I've not enjoyed, I've copped too much flak from rabid fans in the past, so you can assume 'no comment' is a bad comment - but realised that there are already so many good ones out there that this would be redundant. Instead, here's a link to Boardgamegeek's entry for Odin's Ravens, which contains a lot of helpful info. Incidentally, I'm not so sure about the new appearance of the BGG website, I kinda liked the old one as I knew what was where. But anyhow, this is a also worth checking out if you've played the previous version of the game: Is it worth looking at the second edition if you already own the Cosmos version? A very pleasant back story to Osprey publishing this game is that it had previously been running as a Kickstarter by another company, which failed and I've read that the backers got their fingers burned. Osprey seem to have got hold of that list of backers and offered them all a freebie copy of the new edition, despite the previous problem being nothing to do with them. Nice, eh? And finally, by happy coincidence and taking a very different approach to a normal review, top man Dalauppror happened to publish a write up about it only yesterday. All in all, I'd say Odin's Ravens is my favourite game of the new Osprey catalogue to date, although of course, I was a fan of the game already. Not the greatest card game you'll ever play, but a decent, fairly short game to fill some time when you're in the mood.